While planning your trip to Russia, please check the information on what documents you need for staying in Russia. Migration Card. You need to have Part B of the migration card with you anywhere you go. Part A of the migration card should be given to the passport control officer on the state border upon the entrance to the territory of the Russian Federation. Part B of the migration card should be maintained for the whole duration of stay in the territory of the Russian Federation, and should be given to the passport control officer on the state border upon the exit from the territory of Russia. Notification of the foreign citizen's arrival at the place of residence (the detachable part). Every citizen who enters the territory of the Russian Federation for more than 7 days, must stand on migration registration at the place of residence. The host party (in our case - the Institute) should notify the Federal Migration Service (FMS) of the Russian Federation on the arrival of a foreign citizen. The foreign citizens take the detachable part of the Notification (see photo) and should have it with them anywhere they go. 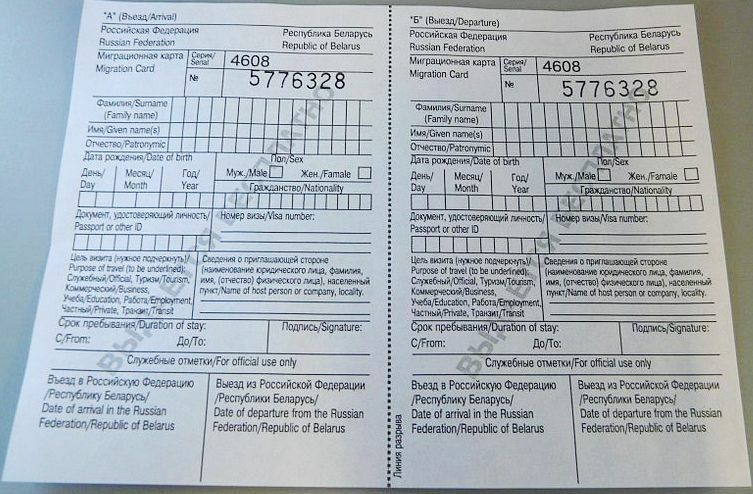 The fact that the foreign citizen has the detachable part of the Notification with the mark of reception, confirms his/her migration registration, and thus it complies with immigration legislation of the Russian Federation. To see the official information on the migration legislation in Russia, click here. Student card or guest ID card are issued by the Institute upon the arrival of the citizen to the Institute. It is required for admission to the Institute - in the teaching rooms and dormitory. Medical insurance, which covers all the period of your stay in Russia. You may arrange insurance in the institute or in any insurance agency in Moscow.